Managing records is one of the more challenging and least prioritized efforts at many businesses. Your company’s entire life is stored in your files (whether they are digital or physical), and keeping your records organized, easily accessible, and secure will help streamline workflow for every department. When it comes to deciding how to manage and store your documents you have many options—onsite, offsite, physical records, or digital files, etc. 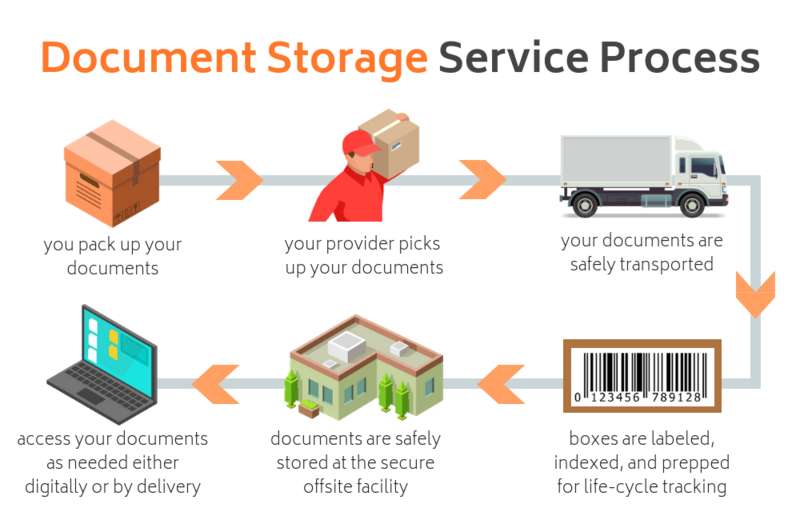 Using a storage service provider for your physical documents, digital files, and information stored on tapes will help you ease the pain of continuous storage and retention cycle tasks. 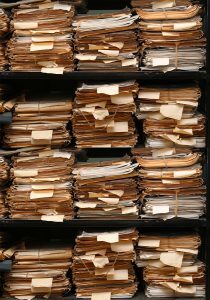 Document storage service providers take care of the details and mundane administrative chores associated with document organization and access so you can focus on your job. Offsite records storage facilities are designed with protection in mind with features such as fireproofing, temperature and humidity controls, flood protection, and even underground vaults. Storing your documents off-site or digitally means you can free up space in your office and reduce clutter. Moving records offsite or storing them electronically means you can free up costly retail space at your office and use it for more pertinent needs or downsize. Offsite document storage facilities are highly secure with features such as 24/7 video surveillance or live guard patrol, highly advanced digital security systems, and strict access controls. Storage providers are aware of and comply with all federal, state, and local information security laws, ensuring your private information is not at risk. Removing unnecessary documents from the office and getting organized will help employees find the documents they need faster, resulting in increased efficiency and productivity for everyone. Record Nations has a nationwide network of trusted document management service professionals. We provide free quotes to organizations across industries looking for a secure and affordable solution to their document management needs. If you need an offsite storage option with RFID ready storage boxes, online access to documents stored offsite, regular inventory audits, or fast delivery services—we can help! Manage your records more efficiently with Record Nations’ network of storage professionals. Get a free quote on your project today by calling us at (866) 385-3706 or filling out our form. Safely store your physical documents at a secure, climate-controlled facility or underground vault. With features including cameras, 24/7 guarded patrol, temperature and humidity controls, fire-proofing and more, you can ensure your documents are safe. Storing your records digitally saves space and money. Advanced security systems with two-factor authentication, password protection, encryption services and more will allow you to safely store your documents digitally and access them from anywhere with an internet connection. Organizing your digital documents is necessary in order to streamline business operations, and choosing the right DMS or ECM is the first step. Find the right foundation for your digital files and have your items indexed, tagged, and scanned with OCR so you can quickly and easily find what you need. Information stored on tapes, microdata, and other media types must be stored properly. Store your tapes at a facility designed to manage media with rotation services, delivery services, consultation services, and inventory auditing services. Every industry has certain aspects that could complicate document conversion and your document management process. Here are our Industry specific services. Record Nations understands how difficult it is to find a secure, trustworthy, and efficient document storage solution for your business information. We partner with hundreds of trusted local storage service providers across the nation to help organizations of all sizes find the right service for their needs. Whether you are looking for a physical location nearby to store your records at, or if you are interested in going digital and managing your documents in a secure electronic document management system, we can help. Call us today at (866) 385-3706 or fill out our form and get free quotes on secure document storage services in your area.